SMYRNA, Ga. – Sep 24, 2018 GLOCK, Inc. expands the 5th Generation of GLOCK pistols with the addition of two modular optic ready platforms. The GLOCK 17 Gen5 MOS and GLOCK 19 Gen5 MOS come optic ready right from the factory and enable users to mount their preferred reflex sights to their pistol in order to improve their target acquisition. 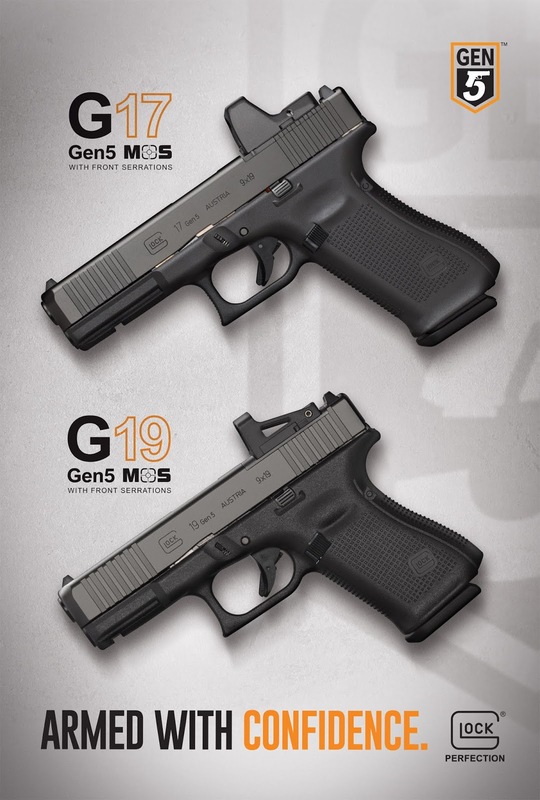 The G17 Gen5 MOS and the G19 Gen5 MOS will be available for purchase starting October 5th, 2018 at participating dealers. Taking on the Crossover design of the GLOCK 19X and the superior GLOCK hard-surface finish in non-reflective black, the G45 makes the ultimate service pistol. Engineered with the GLOCK perfection promise, the G45 features the Safe Action System® and is backed by torture-testing that has made GLOCK a name synonymous with innovation and reliability. For more information about the new Compact Crossover G45, contact GLOCK, Inc. or go to us.glock.com/products/G45.